We recognize that your privacy is important. 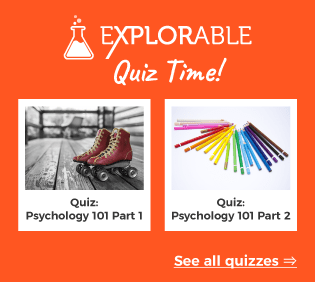 This document outlines the types of personal information we receive and collect when you use Explorable.com, as well as some of the steps we take to safeguard information. We hope this will help you be informed about what personal information you share when using Explorable.com. We at explorable.com strive to maintain the highest standards of decency, fairness and integrity in all our operations. Likewise, we are dedicated to protecting our online visitors' privacy on our website. Explorable.com collects personally identifiable information from the visitors to our website only on a voluntary basis. Personal information collected on a voluntary basis may include name, postal address, email address, company name and telephone number. This information is collected if you request information from us or request some other service or information from us. The information collected is internally reviewed, used to improve the content of our website, notify our visitors of updates, and respond to visitor inquiries. This website is directed to adults (e.g. students, teachers, parents); it is not directed to children under the age of 13. We operate our site in compliance with the Children's Online Privacy Protection Act, and will not knowingly collect or use personal information from anyone under 13 years of age. The personal information about you on explorable.com will never be given away, released or sold, unless there are an informed consent or it is clearly stated or in case of concern about illegal/unethical activities. However, collective non-identifiable data might be released. This website strives to provide correct information. However, although not intended, we have occasional slips in our content and communication. It might be a sloppy way of saying something, simplifying a phenomenon too much, unintentionally making ourselves misunderstood or just a plain error. We always recommend that you double check our information with other sources as we can not guarantee that everything on the website is correct. If you do find an error, please report it to us on our contact page. This website occationally have affiliate links, for example to our books. Explorable.com follows a standard procedure of using log files. These files log visitors when they visit websites. All hosting companies do this and a part of hosting services' analytics. The information collected by log files include internet protocol (IP) addresses, browser type, Internet Service Provider (ISP), date and time stamp, referring/exit pages, and possibly the number of clicks. These are not linked to any information that is personally identifiable. The purpose of the information is for analyzing trends, administering the site, tracking users' movement on the website, and gathering demographic information. Like any other website, explorable.com uses 'cookies'. These cookies are used to store information including visitors' preferences, and the pages on the website that the visitor accessed or visited. The information is used to optimize the users' experience by customizing our web page content based on visitors' browser type and/or other information. Note that Explorable.com has no access to or control over these cookies that are used by third-party advertisers. Explorable.com does not knowingly collect any Personal Identifiable Information from children under the age of 13. If you think that your child provided this kind of information on our website, we strongly encourage you to contact us immediately and we will do our best efforts to promptly remove such information from our records.